We offer you over 33 years of custom framing experience and with all work being done on the premises, you can rest assured that your treasures are safe and secure. A large selection of local sports art is available framed or unframed to add some special pieces to your collection. Autographed limited edition prints, photographs and original art are available for your selection. We feature limited edition collectible pieces by REICH PM and the HIGHLAND MINT. With over 1200 frame samples and 400 mats available, you are sure to find the right combination for your special piece. We feature TRU VUE glass products including Museum Glass. This glass offers protection from harmful UV rays along with the best clarity in the industry. Museum Glass eliminates glare while protecting your piece, allowing all the beauty to be admired for years to come. Stop in to see what a difference Museum Glass can make on your piece. 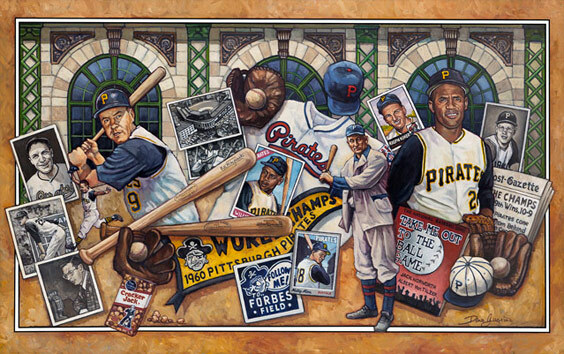 GALLERY IN THE BURGH specializes in custom framing your sports collectibles - especially those special autographed jerseys. Stop in for a quote and some creative ideas on how to best display and preserve your favorite jersey. HENRI PLISSON - captures the power of the sea in this photo "Coup de Vent sur les Poulains." Stop in to see this and other photography that will take your breath away.